The first night we applied this, we woke up with the softest and hydrated faces we’ve had in a long time. (read – WEEKS). So what is this stuff anyway? 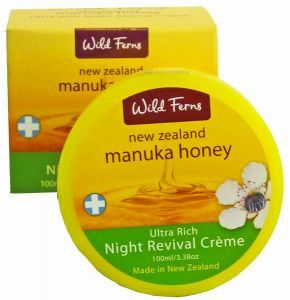 – Key ingredients: Pure Manuka Honey, vitamin E & Neroli oil. No joke, Manuka Honey is a miracle. It helps to heal, it helps to calm, it helps to moisturize like it’s nobody’s business. It helps with skin conditions like rosacea and acne. Is this really greasy and will it make me break out? – It’s not greasy. It is absorbed into your skin relatively quickly. As for break outs, we didn’t experience any and neither did our friends. However, each skin is different ; we hope if you try it you will love it as we do. ProTip – for super dry skin, this can be used during the day. It works well blended into foundation or your V-Primer. This is only $15.00 for 3.3 oz available at http://korunaturals.com/ or through Amazon. Yes, Old Man Winter is slowly inching his way out. But, it won’t be long until your skin is sun parched and will need a moisturizer with more punch. Invest now and don’t suffer in July. ← E.L.F.Dramatic Lashes – the best $1.00 you are about to spend! Hi you have a nice site over here! Thanks for sharing this interesting information for us! If you keep up this great work I’ll visit your blog again. Thanks! are you still having the problem getting the page to load? Hi there, after reading this remarkable paragraph i am as well cheerful to share my know-how here with mates. It’s not my first time to visit this website, i am visiting this site dailly and obtain nice data from here everyday. in the sun. A beaten egg or egg yolk hydrates dry skin. favourite sport are also good ways of beating stress. oooh we need to try that! Such clever work and reporting! Keep up the awesome works guys I’ve added you guys to my blogroll. this submit was once great. I don’t realize who you’re however certainly you’re going to a famous blogger for those who are not already. Cheers!